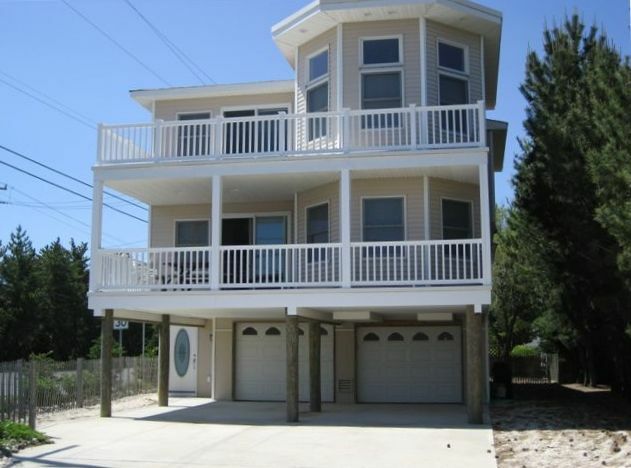 Lovely 4 Bedroom., 3.5 Bath home to accommodate your relaxing vacation in beautiful Harvey Cedars. A great location, just a 1/2 block to the beach as well as a short distance to the bay for all your boating amenities. As you enter, there is wall to wall carpet. On the first floor there is a modern kitchen overlooking a spacious great room. 3 bedrooms and 2 full baths to guarantee your comfort. Outside, enjoy dinner or a glass of wine at the table and benches. On the second floor there is another complete kitchen, spacious great room and an elegant alcove for reading or watching a show on our new plasma TV. In the master bath, there is a luxurious steam shower and his and her sinks with granite countertops. Escape to the rooftop deck and view the bay or the ocean on a clear day or gaze at the stars at night. You can see the ocean from the rooftop deck. You can see the ocean and the bay from the rooftop deck. There is a microwave in the kitchen on the main floor. The house contains two full kitchens each containing an oven, refrigerator, dishes, glassware, silverware, pots and pans.